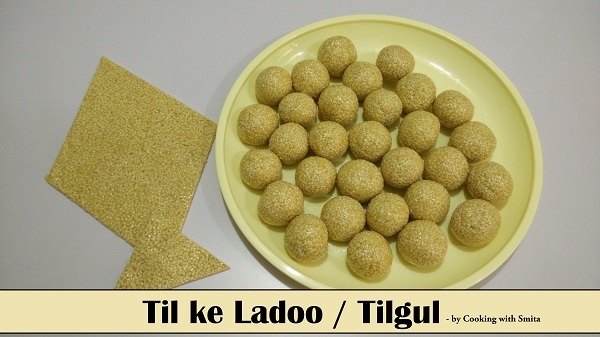 Til ke Ladoo / Tilgul Laddu is a traditional winter sweet recipe made especially during Festival of Makar Sankranti. It is very simple to make yet delicious and Healthy too. Learn how to make soft Til ke Ladoo with Jaggery at home. Dry roast Sesame seeds over medium heat for 5 – 7 minutes. Switch off the gas and shift roasted Sesame seeds in a plate to cool down. Heat 1 tbsp Clarified Butter in a wok over medium flame. Add Jaggery, stir continuously and cook over medium flame till it melts completely. After Jaggery is completely melted, cook for some more time till you see small bubbles. As soon as you see bubbles in melted Jaggery, add roasted Sesame seeds. Mix till Jaggery & Sesame seeds are incorporated well. Switch off the Gas and let the mixture cool down a bit so that you can roll balls from it. Roll small or medium size balls / Ladoos as per your desired size. Enjoy Til ke Ladoo during the winter season.